Explanation: On the night of December 13, 1908, 100 years ago today, the 60-inch diameter reflecting telescope of Mount Wilson Observatory was first tested on the stars. 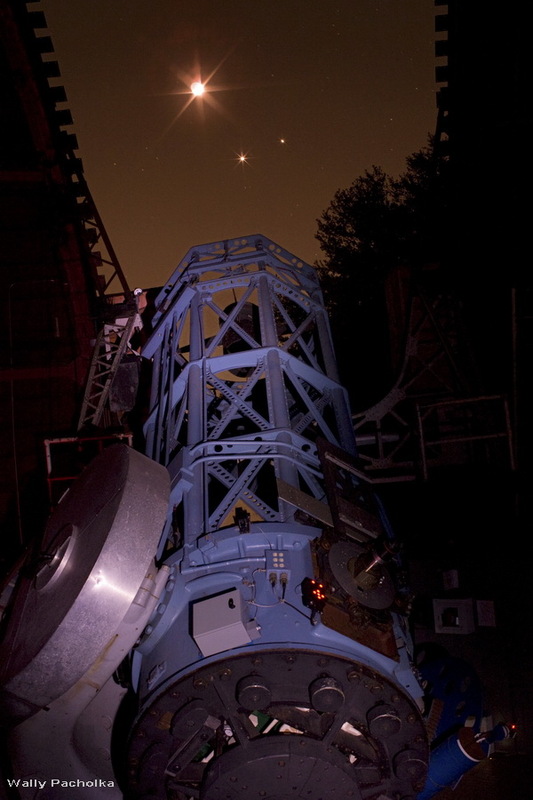 It became the first successful large reflecting telescope. The 60-inch reflector demonstrated a scalable design that used a mirror to gather faint starlight, rather than a large and more difficult to support lens, becoming the granddaddy of all, even larger, modern telescopes. Now-famous astronomers, including Harlow Shapley and Edwin Hubble, were able to use the 60-inch reflector to embark on a new kind of exploration of stars, distant galaxies, and the nature of the universe. Still looking skyward a century after its first light, the historic telescope is seen here pointing toward one of the most recognizable celestial events of 2008, the remarkable conjunction of Moon, Venus, and Jupiter.